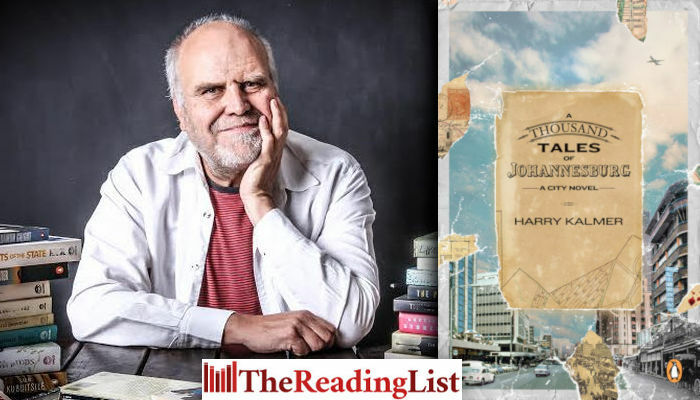 Thousand Tales of Johannesburg is Harry Kalmer’s spellbinding ode to Johannesburg and its people. Cherie sat with a can of Heineken beer and a recipe book at the table in May Villa’s kitchen. The dish she wanted to cook for the guests was easy to prepare. She stood up and took a pack of chicken breasts from the fridge, cut them into strips with one of Bosman’s sharp chef’s knives and dipped them in flour. She grated two hard green apples and melted four tablespoons of butter in the heavy-bottomed pan she lifted off a silver butcher’s hook on a rail hanging over the gas stove. When the flour-covered strips of chicken turned golden brown, she placed them in a blue enamel bowl. She chopped up two purple onions, threw them into the pan and covered the vegetables with a teaspoon of Rajah curry powder. She added the grated apple to the onion and took a bottle of brandy from the well-stocked liquor cabinet in the lounge. After sprinkling a shot of brandy over the apples, she poured the rest of her can of beer into the pan. There was no cream in the fridge. She looked at her watch. The Spar in Kitchener Avenue and the Pick n Pay in Darras Centre would both be shut. She sent an SMS to Bosman: Bring sour cream. The SMS beep interrupted Bosman’s memories of Ahmed’s grandmother. He realised he had taken a wrong turn and had entered an informal settlement. The streets between the houses were narrow. He thought about Ahmed and Samson and offered up a quick godless prayer. He doubted that any shops in the settlement would stock sour cream. The narrow streets, weakly lit by the glow of high orange spray lights every few hundred metres were busy and too narrow to turn the car around. He drove slower than ten kilometres an hour and stopped often so that pedestrians could step out of the way. A group of young men on a corner watched him with detached interest as he drove by. Office workers and people in overalls and uniforms were on their way home. Children in school uniform played football on a small piece of open ground. Through a window he saw people inside a tavern watching TV and drinking beer. He stopped next to a line of businesses to ask for directions. A woman sat behind a table piled with large cabbages, bunches of carrots and sheaves of spinach. Next to her there were two silver metallic cages in which were white chickens with red combs. All this was lit by a reading lamp at the end of an extension cord. Behind the woman’s table and chicken coop was a purple brick building on which the words ‘Elegance Beauty Academy – Your comfort is our concern’ were painted in hesitant yellow letters. Next to the building was a red caravan without wheels with a yellow flamingo and the words ‘Same Day Dry Cleaners – Dress Clean Look Smart’ on its side. A spaza shop in a shipping container advertised Awethu Mageu at eight rand a litre. Bosman climbed out and walked over to the woman. She spoke neither Afrikaans nor English. He started walking towards the caravan but stopped after two metres. May Villa’s hijacked minibus was parked underneath a lean-to behind the caravan. He took a deep breath and slowly walked back to his car. He locked the car doors from the inside, took out his cell phone, and called Dubcek. In 2014, his drama The Bram Fischer Waltz won the Adelaide Tambo Award for Human Rights in the Arts. A Thousand Tales of Johannesburg won the 2018 Barry Ronge Fiction Prize. He lives in Johannesburg.